If you have leukocytes in the urine (especially high levels), it means that you have some kind of infection or disease in the urinary tract. In this case you have to treat the infection to prevent damage to your bladder or your kidneys. In this article I’ll cover the most common causes of leukocytes in urine and stool with possible treatment options. 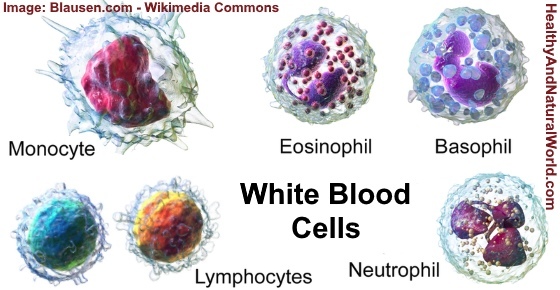 Leukocytes are also called white blood cells (WBCs) and they make up about 1% of an adult’s blood. These blood cells play an important role in our immune system by fighting disease and infections. Leukocytes act in a similar way to how guards would defend an ancient city. At the first sign of an invasion, the guards would assemble and then attack the invaders. When we have an infection, white blood cells ‘travel’ to the affected area to destroy and break down the ‘invaders’. Doctors usually perform a blood test of white blood cell (WBC) count to measure the number of white blood cells in your body. Elevated white blood cell count is a sign that your body is fighting an infection. More specifically, testing the number of leukocytes in urine and stool can help doctors to see if there are infections associated with our digestive or urinary systems. Your urinary system is composed of different parts such as the kidney, bladder, urethra, and ureters. So leukocytes in your urine could mean that there is an infectious disease in any of these body parts. Doctors may use chemical test strips to detect substances known as leukocyte esterase and nitrite in the urine. Both of these substances could indicate an infection. High levels of leukocytes in urine with or without nitrites could mean that you suffer from a disease such as urinary tract infection, bladder inflammation, enlarged prostate, diabetes, or kidney stones. Monocytes – They respond to inflammation and they attack the foreign matter. They are also important for boosting the immune system. The journal Clinical Infectious Diseases also says that monocytes release cytokines which cause fever2, which is another way the body fights infection (read more about fever in my article on how to break a fever: the top 5 natural ways). Lymphocytes – There are 3 types of lymphocytes – B cells, T cells, and Natural Killer (NK) cells. The B cells are responsible for creating antibodies, and attacking ‘foreign matter.’ The T cells attack cells in the body which are infected.3 Low lymphocyte count (Lymphocytopenia) could indicate that you are at greater risk of developing infections. Read more about antihistamines in my article about the best natural antihistamines to fight allergic reactions. Let’s look at the possible causes of leukocytes (white blood cells) in urine and stool. Usually, the kidneys don’t allow any kind of blood cell to pass into the urine. Therefore, the presence of white blood cells in the urine means that there is some kind of infection or disease. When doctors use a dipstick test for urine infection, these detect certain chemicals in the urine. Chemical test strips can pick up substances known as leukocyte esterase and nitrite in the urine. Both of which are potential indicators of infection. Let’s have a look at some of the most common causes of leukocytes in urine. Urinary tract infections (UTI) are a common cause of white blood cells (leukocytes) in urine and cloudy urine. UTIs can happen when bacteria (most commonly Escherichia coli, or E.coli bacteria strain) enter the urinary tract and cause infections. Because a woman’s urethra is shorter than men’s, they are more at risk of suffering from UTIs. To find out about other ways to treat urinary tract infections, please read my article on how to treat urinary tract infection (UTI) naturally. Bladder inflammation (also called interstitial cystitis) can also cause leukocytes in urine.8 Some of the symptoms of bladder inflammation are pain in your lower tummy region, feeling pressure and pain in your bladder, needing to pee frequently and cloudy urine with sediment. The Interstitial Cystitis Association (ICA) says that bladder retraining will help to control your urge to urinate and improve your symptoms, once your pain is under control. During pregnancy, women may be more prone to urinary tract infections. This is because of hormonal changes in the urinary tract and because it can be more difficult to completely empty the bladder, thus leading to infections. Therefore, white blood cells could show up in urine during routine testing. It is important to treat any kind of urinary tract infection (UTI) during pregnancy. Dr. John Delzell from the University of Missouri-Columbia School of Medicine said that these infections can lead to inflammation of the bladder or pyelonephritis, a condition which can infect the kidneys.10 This is a serious condition which can also affect the unborn child. Kidney Stones. The journal Urology published a report showing that in almost half the patients who had kidney stones removed showed a high urine leukocyte count.12 Symptoms of a kidney stone include severe flank pain and blood in the urine (medical term is hematuria). If you suffer from kidney stones, read my articles on how to treat kidney stones naturally and how to use apple cider vinegar (ACV) for kidney stones. Using a catheter. Using a catheter can allow germs and bacteria to enter the bladder and cause infections. Blood in the urine (medical term is hematuria). If you have white blood cells in your urine without an infection present, you may suffer from sterile pyuria. Sterile pyuria describes a conditions where a laboratory examination detects leukocytes in urine without bacteria. According to the New England Journal of Medicine, sterile pyuria is a common health condition affecting 13.9% of women and 2.9% of men. The frequency of detection of sterile pyuria was 23% among inpatients. There are quite a few causes of sterile pyuria such as sexually transmitted disease (STD), fungal infections as well as viral infections. The treatment for white blood cells in urine usually depends on the cause of the infection. For example, doctors may prescribe antibiotics if you suffer from a urinary tract infection (UTI). Leukocytes can also show up in your stools if you have a digestive tract disorder. As with the urinary system, there should not be any white blood cells in stools. The number of leukocytes in stool can indicate the type of condition a person is suffering from. Crohn’s Disease can affect any part of the digestive tract and cause inflammation and swelling. The presence of white blood cells in stool can be an indicator that there is an inflammation in the digestive tract. Inflammatory bowel disease can be difficult to treat and many doctors recommend trying to identify triggers in your diet and lifestyle. A study published in the journal Clinical Gastroenterology and Hepatology reviewed many studies on diet and inflammatory bowel disease.17 They found that high-fat diets seemed to be a common factor in many people with IBD. It was also found that a diet with high levels of meat (especially red meat), eggs, protein, and alcohol can cause a relapse of inflammatory bowel disease. So, if you have IBD, you could try to keep a food diary to try to identify certain foods that cause the symptoms and then cut, or reduce these foods from your diet. 2. Circulating cytokines as mediators of fever. 4. Histamine release from basophils. 6. Diagnosis of urinary tract infections. 7. Cranberry juice lowered the number of urinary tract infection episodes. 8. Role of bladder function and interstitial cystitis. 10. Urinary tract infections during pregnancy. 11. Urinary tract infections during pregnancy. WebMD. 12. Leukocytosis for infectious complications after percutaneous nephrolithotomy. 14. Urinary tract infections in patients with type 2 diabetes mellitus. 17. Diet and inflammatory bowel disease. 19. Diet with symptoms of inflammatory bowel disease. Do you have to take medications to mediate your condition if you have Crohn’s disease, or can you simply watch your diet. Also, if you have 2000 WBC in your stool, what does this mean. Is it dangerous. Hi Sani, from what I’ve read in medical websites, there is currently no cure for Crohn’s disease, and there is no one treatment that works for everyone. Many of the patients require medications as well as a special diet and lifestyle changes. If there are complications of the disease then some people will require a surgery. I guess that you can try diet first to see if it relieves the symptoms. You can always add medications if you need, and off course consult with your doctor as I’m not a doctor. As for WBC in stool – if you have a digestive tract disorder then leukocytes can be present in your stools. The number of leukocytes in stool can indicate the type of condition a person is suffering from. Since I’m not a doctor, I don’t know what the number 2000 indicates, and this needs to be discussed with your doctor.